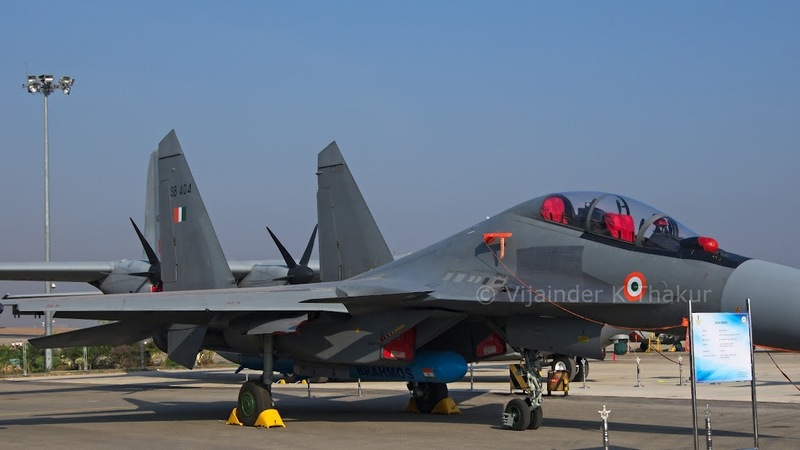 First IAF Su-30MKI modified to carry Brahmos-A, the ALCM variant of the Brahmos supersonic cruise missile at Aero India 2015 in Bengaluru. SatNav signal jamming is poised to reduce the accuracy of the Indian Brahmos supersonic cruise missile, as also any other conventional cruise missiles that relies on accuracy for its destructive potential. The Brahmos missile uses SatNav as its primary navigation system and is claimed to have a CEP (Circular Error Probability) of 3-m. As a backup, the missile has a ring laser gyro based inertial navigation (IN) system developed at Research Center Imarat (RCI), Hydrabad. IN systems are prone to drift with time and need to be periodically fixed. Cruise missile IN systems are fixed using the primary SatNav system. In case of SatNav signal jamming, the accuracy of a cruise missile would depend on the time elapsed since the last fix. IN system CEP is significantly higher than SatNav and increases linearly with time. India is planning to reequip Brahmos with a more accurate fallback IN system developed by French company Safran (Sagem). The US military is heavily dependent on its GPS system for the accuracy of its smart weapons and cruise missile. Tass reported on June 25, 2014 that Russia’s Radio-Electronic Technologies Group (KRET) is developing a fundamentally new EW system that will target space based communication, navigation and surveillance. The multifunctional system, mounted on ground and airborne platforms, would 'switch off' all adversary satellite terminals, sending adrift aircraft, cruise missiles, and smart bombs that rely on SatNav, besides degrading adversary command and control. The use of the term 'multifunctional' suggests the system uses several different jamming and spoofing techniques. The system, which is currently being tested in workshops, will be field tested by the end of the year. Meanwhile, according to this report, the Pentagon is planning to setup a new joint command cell in the next 6 months to protect US space based assets against attacks from China and Russia. U.S. Deputy Secretary of Defense Robert O. Work told the annual GEOINT symposium on Tuesday, June 23, 2015 that the cell will receive data from satellites belonging to all U.S. government agencies and coordinate response to attacks. The scale and geographical spread of US military operations is so vast that US forces cannot retain their edge against regional powers like Russia and China without relying heavily on space based assets. Potential US adversaries recognizing the US dependence have acquired the capability to attack US satellites using soft kill (jamming, blinding), or hard kill (microwave / laser frying, kinetic attack). “The ugly reality that we must now all face is that if an adversary were able to take space away from us, our ability to project decisive power across transoceanic distances and overmatch adversaries in theaters once we get there … would be critically weakened,” Work told the symposium. Senior officials at the Pentagon and Office of the Director of National Intelligence are still finalizing details of the new center, which will back up the military’s Joint Space Operations Center at Vandenberg Air Force Base, California.